RUN TIME: Appox. 30 min. per Episode. 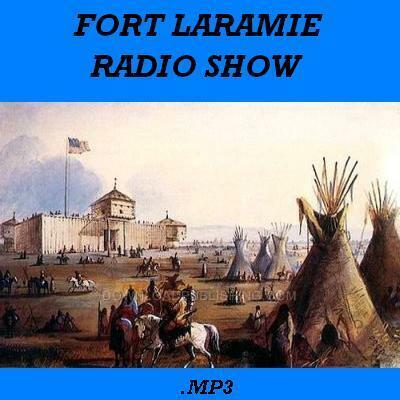 "Fort Laramie, Starring Raymond Burr. Transcribed Tales of the dark and tragic ground of the Wild Frontier. The Saga of Fighting men who rode the rim of empire and the dramatic story of Lee Quince, Captain of Cavalry." Norman MacDonnell, the Creator of "Gunsmoke" wanted his new series to be Historically correct and insisted to his writers to use the correct building names of the Fort, geographic location names and correct Indian Lore and practices. 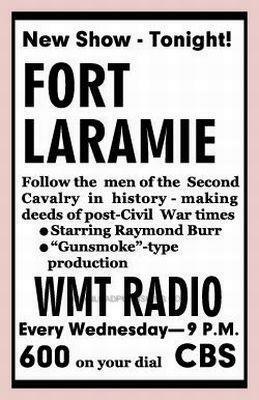 Fort Laramie aired forty one episodes from January 22, 1956 to October 28, 1956. The First Episode is the audition tape that was recorded on July 25, 1955.